The Mirage resort located at Alexandra Headland is a four and a half star Sunshine Coast luxury resort. 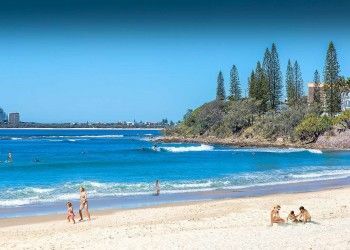 Set back just fifty metres off the main road, this beachfront resort offers beautiful views without any traffic noise and is just a short walk from Mooloolaba and Maroochydore. Featuring one, two or three bedrooms with a large balcony, all east-facing and harbours a stunning view of the pools, gardens, lagoon, park and the ocean, are appealing with a tranquil outlook. 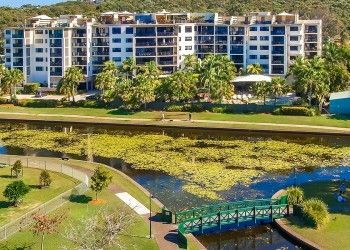 Directly opposite to this resort accommodation on the Sunshine Coast is Lake Nelson Park, home to different varieties of birds, including the famous swans. This Alexandra Headland resort’s facilities are world class; heated lagoon, lap and spa pools, heated childrens pool with a cascading waterfall, gymnasium and sauna all set in the back drop of a tropical gardens. 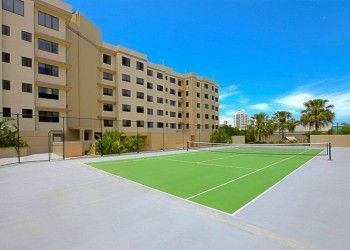 Unlike many other hotels, there is a full sized tennis court and a half basket ball court so the whole family can keep fit and active while on holiday. There is also a childrens play area outdoors and optional babysitting in room service so you can go out for a romantic dinner and feel safe that the kids are in safe hands. In this enviable position in Alexandra Headland we are just fifty metres from the restaurants, cafés, surf clubs and patrolled family friendly beahes. Our newest feature at our resort accommodation Sunshine Coast is the wireless free high speed broadband internet so you can now stay in touch with home and work whilst on holiday. All of the rooms have free foxtel, DVD players and stereos, as well as air conditioning and laundry facilities. With all this to enjoy, we look forward to welcoming you to this Sunshine Coast luxury resort.